Escape Concepts features hand poured jar candles and handmade aromatherapy pillar candles. They are some of the best candles on the market! These are high quality candles. Different waxes melt at different temperatures. Therefore, the size and shape require precision blending to burn well. Some of the wicks are made of unbleached cotton and all contain no lead. The color is uniform throughout. Essential oils and highly scented fragrance oils are used to scent the candles. This is the reason why the fragrance is uniform throughout the life of the candle. When the candles burn, they burn evenly to utilize every ounce of wax! Escape Concepts knows that you are tired of throwing away wax after the wick is gone and you are tired of the scent changing every time you light the same candle. Now you can experience what a great candle is really like.These candles would make great wedding favors or wedding party gifts. These clear wax jewel candles are really nice. ; They burn up to 30 hours. 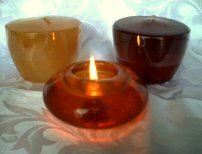 ; The clear wax jewel candles are not gel candles; They are made of a clear wax using a special process. ; The clear wax jewel candles "glow" when the burn. ; Just beautiful. ; The clear wax jewel candles make great gifts. These fruit tealight candles smell wonderful! 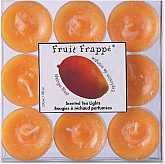 The fruit tealight gift pack contains 9 fragrant tealight candles in a clear pvc box. They come in 4 wonderful fragrances, raspberry, mango, honeydew melon, and watermelon. These make great gift alone or paired with our fruit line of bath and body products. Price is per box.